You know that high you get when you receive multiple compliments on your outfit? Well, I was high as a kite last night, because boat loads of people were gushing over my metallic Haney blouse, above, and also proud, because my blouse was designed by my bestie Mary Alice Haney! 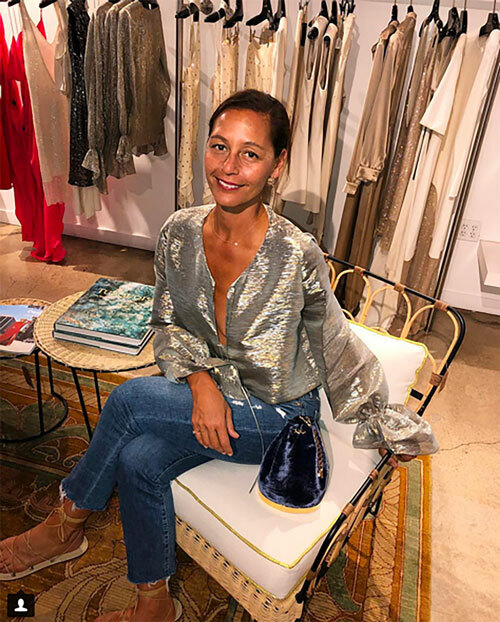 What's more, she just opened a pop-up store at the Brentwood County Mart in LA with Adina Reyter (truly my favorite kind of blingy everyday jewelry) and Tyler Ellis, whose gorgeous velvet bag is perched next to me, above. If you're in the hood, I suggest you pop in before it closes on October 15! P.S. I might just be wearing this top for the next month straight. I love it so much!